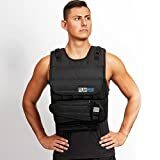 100lbs Weighted Vest - Top 3 Choices (2018 Update) - Eat. Move. Hack. 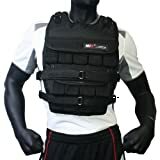 Are you looking for the perfect 100 lb weight vest? Most weight vests don’t go up that high in weight or sometimes aren’t made of quality material. We have found the best 100 lb weight vests and you can check out our comparisons below. Let us know if you have any questions in the comments below. 100LBS Weights Included. Two Velcro belts included. The ZFOsports 100LBS ADJUSTABLE WEIGHTED VEST comes equipped with a full set of weights that can be adjusted accordingly depending on your resistance. The vest comes with weights range that from 3lbs to 140 lbs. Its removable weights are conveniently located higher on the body trunk protecting your stomach from uncomfortable pounding while in motion. It has a subtle touch throughout your body during exercising. It is expertly crafted out of heavy-duty 1200D reinforced nylon and includes double padded shoulders for enhanced comfort. The mesh is breathable and has two adjustable straps that conveniently slide through the D-rings. They help to easily adjust the body length of the vest according to your needs. The packets holding the removable weights are fitted with durable Velcro to snugly secure them in place. It is ideal for all-around training and it is a one size fits all! It is a concretely designed and sturdy weighted vest. Crafted to last long form a heavy-duty 1200D reinforced nylon material. Lined with a breathable vent for breathability and improved comfort during exercising. Concrete weights designed out of iron and not sand as other weighted vests. Strong weight pockets fitted with Velcro that securely hold the weights in place. One size fits all vest that comfortably gives you a universal fit. This vest is expensive to ship due to the additional weight from the Full set of weights. CONSTRUCTION - Made from reinforced nylon and polyester. Dimensions vary depending on size selected. COMFORT - Fully adjustable waist belt and padded shoulder straps allowing for a snug and secure fit. WEIGHT - Adjust total weight by removing or adding individual weight packets. Each packet is filled with 2.5 lb of iron ore fines. FLEXIBILITY - Ideal as additional resistance for any body weight training. Anchor hooks designed for parachute run training. Includes reflective stripes for easy visibility if used during walking or running. TRUST - Trust experience. CAP has been a pioneer in fitness with over 30 years experience and locations worldwide. Chances are if you have ever worked out, you have worked out with a CAP product. 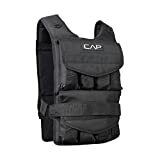 This weighted vest is a product of the renowned brand in the fitness industry, CAP Barbell. If simple cardio doesn’t get your motor running, then this vest is the product for you. CAP Barbell Adjustable Weighted Vest sufficiently supplies resistance to your work-out. It is expertly designed for both genders fitting them comfortably and with ease. It comes in two different weight options, 20lbs and 50lbs.It offers a flexibility aspect that makes it ideal for a range of exercising activities including push-ups, pull-ups, jogging, and rope climbing among others. It features a heavy-duty design enhanced with breathable mesh, adjustability and neoprene padding for increased comfort. CAP Barbell Adjustable Weighted Vest is easy to use and comes with a number of sandbags that easily fit into its stretching pockets. They are also easy to remove while adjusting the weights during exercise. The sandbags range from 1lbs to 20lbs and can be adjusted according to your resistance needs. This vest helps you build your strength and boost your endurance. If you are a music lover, the vest has an extra pocket for your cell phone, iPod or mp3 player. This thoughtful provision allows you to enjoy your music during workouts. It also features reflective strips and quick-release buckles for your enhanced safety. Adding and removing weight is quite easy. Breathable material allows breathing and offers more comfort during intense exercise. It is reasonably priced and affordable to most people. It lacks weighted straps to secure it and as a result bounces while exercising. Shipped in separate packages to ensure item not damaged in transit. One size fits Most, manufacture warranty included. The RUNFast/Max 12lbs-140lbs Adjustable Weighted Vest offers a wide range of weight adjustment depending on your resistance needs. It allows a maximum weight capacity of 140lbs. It features several empty pockets that can be filled later on by purchasing additional weights. The RUNFast/Max is an ideal vest to increase your strength and endurance. The weights come included with the vest and you will just need to purchase additional ones if necessary. It includes options with shoulder pads to enhance your comfort during workouts. The size is one size fits most. Dual straps designed to comfortably hold it in position during exercising. Removable weights that can be adjusted according to your resistance needs. Breathable material that snuggly fits and allows breathing during work-outs. The one size fits most, may not be ideal for shorter people. Tends to concentrate too much weight on the shoulders if not properly used.